After using schwarzkorf bonacure repair rescue shampoo & masque for almost a month. Shampoo worked fine for me but with the application of masque the way my hair dresser told me. He said I should apply it in a straight manner from upper end to the bottom of my tresses, doing so my hand would get full of hair only. That scared me! During my next spa meet I told him about this ordeal. He understood exactly what was happening to me while checking my scalp. The problem was my head used to get oily in just 2-3 days and that was the culprit for all my hair related troubles. Due to this oil, our pores get clogged where dirt & sweat get accumulated, the root cause of dandruff which in turn makes the follicles brittle and loose at the roots hence results in the hair fall. He also suggested me not to wait more than 1 hour after application of hair oil. Since if you have got your hair straightened they will advice you not to use anything apart from their mentioned shampoo, conditioner and serum. 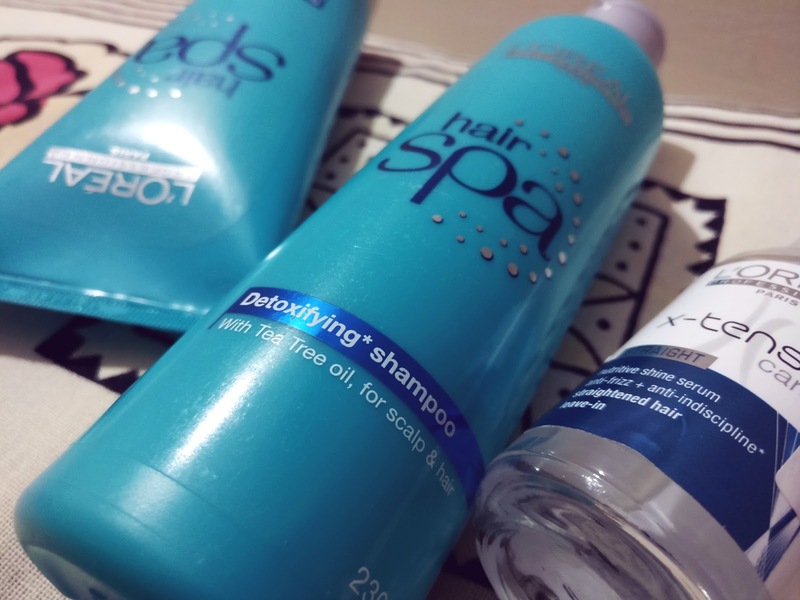 While this time, he did my L'Oreal Hair spa & recommended me to use these products as well. I have used it for a month so that I can put up a genuine review of it. I do wash my after 2 days or 3 days max so that it doesn't get difficult on my next wash to remove the dandruff. Name : L'Oreal Professional Paris Hair Spa Detoxifying Shampoo. 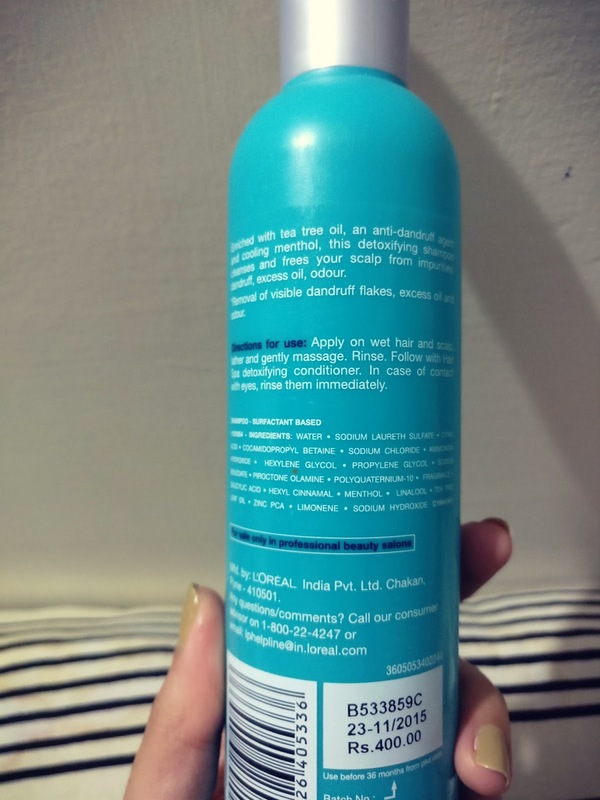 The bottle comes in turquoise blue color with the color free shampoo. It is transparent in color. Both shampoo and conditioner fall in professional range which states to be better than any normal hair care products. Mark the word Detoxifying as hair spa range comes in deep nourishment, smooth revival, repairing type, etc. 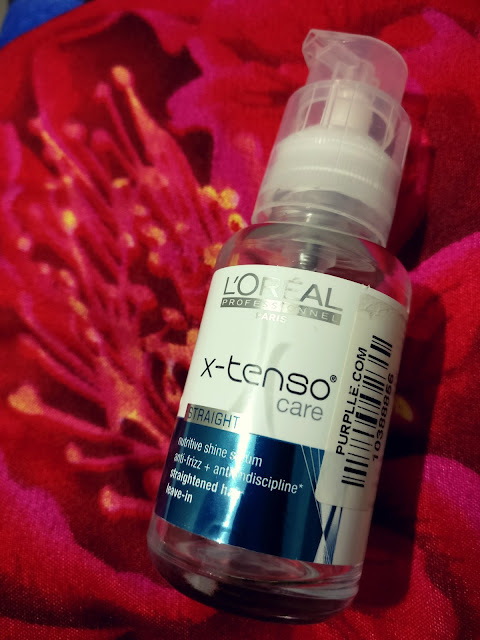 This Detoxifying Shampoo contains tea tree oil which is best known to remove excess oil also used for acne-prone skin and menthol, which has cooling properties. Less hairfall caused till 2-3 days after hair wash. Contains SLS (Sodium Laureth Sulfate ) known to be a pesticide. Doesn't comes in a flip top cover. Lazy me! In all, it is worth the price not that costly also. Only 400/- for 230 ml which is less than other comparable products in the market. 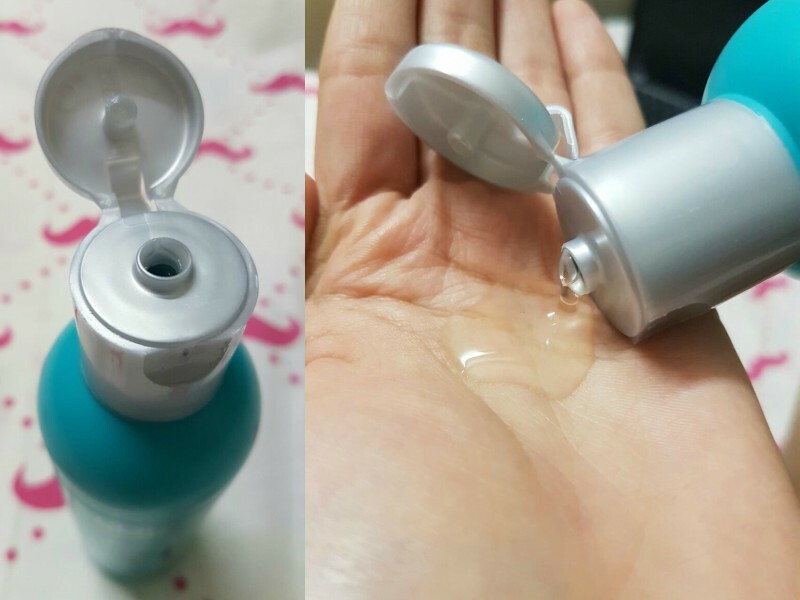 The flip top nozzle is a cherry on the cake, it does not dispense too much shampoo in one go. You can wash off your hair no matter what length in just two squeezes. It is free of SLS and Parabens. It makes hair velvety in touch and is easy to apply. The price is also not too much just 400 bucks for 200 ml. which can be used upto 2 months if you have hair length like mine. 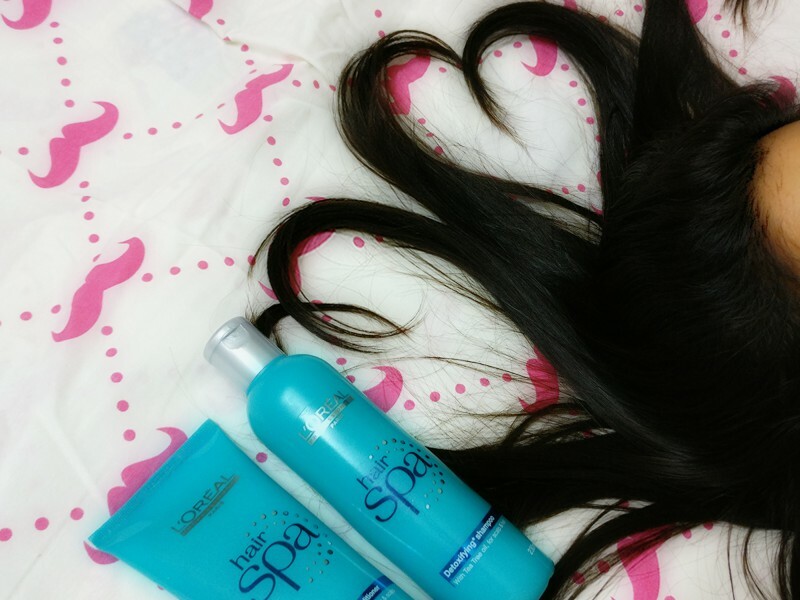 Hair gets soft,shiny & feels hydrated. Doesn't comes in a fliptop cover. Lazy me! But I suppose that's not an issue as it is normal for a few hairs to fall while washing and that too with moving our fingers between them in a straight manner. They are prone to breakage when wet. I am very happy infact contented with all the three products. The conditioner worked great for me as compared to schwarzkopf may be it wasn't for my hair type. But no doubt on the fragrance of their shampoo and conditioner and made my hair silky straight, just the problem was extremely high hair fall. UPDATE : Though it controlled my hairfall to an extent but my hair has started turning grey (may be due to stress, genetics or hair smoothening) so I have decided to go for natural home care remedies using amla, reetha and shikakai. I hope you liked the review, you can suggest on more points. Your suggestions mean a lot to me. Sound is good. Thanks for posting. This shampoo is for oily hair types. Yes it is easy to apply, try not to apply the conditioner on the roots as it coats the surface. 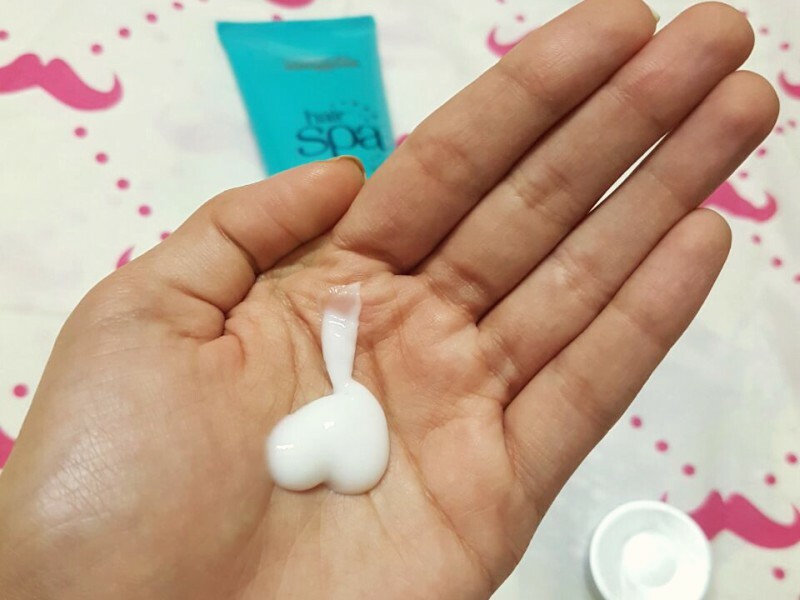 Spread the conditioner on the mid hair to its ends. For home made solution use lemon juice mixed with curd and apply it to the scalp before head wash.You will notice reduction in dandruff and oil. I suffer from a blockage in the pores of the scalp, which hinders the growth of new hair and the emergence of voids in the hair, is there a radical treatment for the treatment of blockage of the pores of the scalp? For pore blockage, I would not suggest for any radical treatment coz it can be treated at home with regular efforts. 1. Use peppermint essential oil with whichever you use. 2. Tea Tree oil is like a god for this case. USE TREE TEA OIL PRODUCTS ON YOUR SCALP.